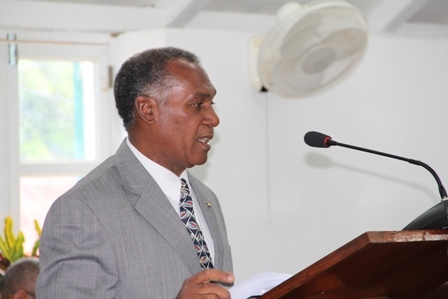 NIA CHARLESTOWN NEVIS (April 29, 2013) — Premier and Minister of Finance in the Nevis Island Administration (NIA) Hon. Vance Amory, said his government inherited an extremely tenuous fiscal situation; one with a high level of indebtedness, a strangling public sector wage bill and a fragile economy. Mr. Amory made that statement when he delivered the NIAs 2013 Budget Address, at a sitting of the Nevis Island Assembly on April 26, 2013. He said the Government’s immediate response was to curtail spending. “Our response within the limited time frame to produce a budget has been to curtail capital and non-recurrent expenditure, to meet the targets prescribed by the International Monetary Fund. “We are also hoping that the completion of the debt restructuring exercise will bring much needed relief by improving the cash flow situation,” he said. However, Mr. Amory stated that the most problematic expenditure had been the wage bill which had ballooned under the previous government and was stifling the Administration’s ability to expand. “There were some unproductive wages that had to be pared but in the main, we have kept the salaries and wage budget intact, recognising the hardship that retrenchment would create in the difficult economic times. “Despite the harsh criticism that we have received from opposition forces trying to distract attention from their mismanagement and incompetence, we have nonetheless been a caring government, motivated by the unselfish desire to serve and protect the interest of all Nevisians and residents,” he said. Mr. Amory further noted that his Administration was mindful that the world was still experiencing the throes of economic recession and as such, there was no room for tax increases. Therefore, its efforts would be focused on improved expenditure management and tax administration.